When he became an apostle, John was twenty-four years old and was the youngest of the twelve. He was unmarried and lived with his parents at Bethsaida; he was a fisherman and worked with his brother James in partnership with Andrew and Peter. Both before and after becoming an apostle, John functioned as the personal agent of Jesus in dealing with the Master's family, and he continued to bear this responsibility as long as Mary the mother of Jesus lived. Since John was the youngest of the twelve and so closely associated with Jesus in his family affairs, he was very dear to the Master, but it cannot be truthfully said that he was "the disciple whom Jesus loved." You would hardly suspect such a magnanimous personality as Jesus to be guilty of showing favoritism, of loving one of his apostles more than the others. The fact that John was one of the three personal aides of Jesus lent further color to this mistaken idea, not to mention that John, along with his brother James, had known Jesus longer than the others. Peter, James, and John were assigned as personal aides to Jesus soon after they became apostles. Shortly after the selection of the twelve and at the time Jesus appointed Andrew to act as director of the group, he said to him: "And now I desire that you assign two or three of your associates to be with me and to remain by my side, to comfort me and to minister to my daily needs." And Andrew thought best to select for this special duty the next three first-chosen apostles. He would have liked to volunteer for such a blessed service himself, but the Master had already given him his commission; so he immediately directed that Peter, James, and John attach themselves to Jesus. John Zebedee had many lovely traits of character, but one which was not so lovely was his inordinate but usually well-concealed conceit. His long association with Jesus made many and great changes in his character. This conceit was greatly lessened, but after growing old and becoming more or less childish, this self-esteem reappeared to a certain extent, so that, when engaged in directing Nathan in the writing of the Gospel which now bears his name, the aged apostle did not hesitate repeatedly to refer to himself as the "disciple whom Jesus loved." In view of the fact that John came nearer to being the chum of Jesus than any other earth mortal, that he was his chosen personal representative in so many matters, it is not strange that he should have come to regard himself as the "disciple whom Jesus loved" since he most certainly knew he was the disciple whom Jesus so frequently trusted. P.1554 - §3 The strongest trait in John's character was his dependability; he was prompt and courageous, faithful and devoted. His greatest weakness was this characteristic conceit. He was the youngest member of his father's family and the youngest of the apostolic group. Perhaps he was just a bit spoiled; maybe he had been humored slightly too much. But the John of after years was a very different type of person than the self-admiring and arbitrary young man who joined the ranks of Jesus' apostles when he was twenty-four. Those characteristics of Jesus which John most appreciated were the Master's love and unselfishness; these traits made such an impression on him that his whole subsequent life became dominated by the sentiment of love and brotherly devotion. He talked about love and wrote about love. This "son of thunder" became the "apostle of love"; and at Ephesus, when the aged bishop was no longer able to stand in the pulpit and preach but had to be carried to church in a chair, and when at the close of the service he was asked to say a few words to the believers, for years his only utterance was, "My little children, love one another." There was another side to John that one would not expect to find in this quiet and introspective type. He was somewhat bigoted and inordinately intolerant. In this respect he and James were much alike—they both wanted to call down fire from heaven on the heads of the disrespectful Samaritans. When John encountered some strangers teaching in Jesus' name, he promptly forbade them. But he was not the only one of the twelve who was tainted with this kind of self-esteem and superiority consciousness. John's life was tremendously influenced by the sight of Jesus' going about without a home as he knew how faithfully he had made provision for the care of his mother and family. John also deeply sympathized with Jesus because of his family's failure to understand him, being aware that they were gradually withdrawing from him. 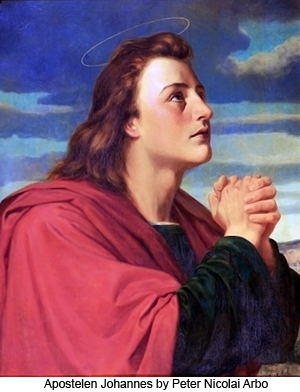 This entire situation, together with Jesus' ever deferring his slightest wish to the will of the Father in heaven and his daily life of implicit trust, made such a profound impression on John that it produced marked and permanent changes in his character, changes which manifested themselves throughout his entire subsequent life. John had a cool and daring courage which few of the other apostles possessed. He was the one apostle who followed right along with Jesus the night of his arrest and dared to accompany his Master into the very jaws of death. He was present and near at hand right up to the last earthly hour and was found faithfully carrying out his trust with regard to Jesus' mother and ready to receive such additional instructions as might be given during the last moments of the Master's mortal existence. One thing is certain, John was thoroughly dependable. John usually sat on Jesus' right hand when the twelve were at meat. He was the first of the twelve really and fully to believe in the resurrection, and he was the first to recognize the Master when he came to them on the seashore after his resurrection. Several years after the martyrdom of James, John married his brother's widow. The last twenty years of his life he was cared for by a loving granddaughter. John was in prison several times and was banished to the Isle of Patmos for a period of four years until another emperor came to power in Rome. Had not John been tactful and sagacious, he would undoubtedly have been killed as was his more outspoken brother James. As the years passed, John, together with James the Lord's brother, learned to practice wise conciliation when they appeared before the civil magistrates. They found that a "soft answer turns away wrath." They also learned to represent the church as a "spiritual brotherhood devoted to the social service of mankind" rather than as "the kingdom of heaven." They taught loving service rather than ruling power—kingdom and king. When in temporary exile on Patmos, John wrote the Book of Revelation, which you now have in greatly abridged and distorted form. This Book of Revelation contains the surviving fragments of a great revelation, large portions of which were lost, other portions of which were removed, subsequent to John's writing. It is preserved in only fragmentary and adulterated form.